The Edinburgh ABC project, provides cycling opportunities to people with additional needs demonstrating almost anyone can cycle with a little extra support and the right infrastructure. The project, which our funding supports, has been on the go for over a year now and has introduced cycling to hundreds of people, whatever their age or ability using Edinburgh’s traffic free cycle network and a range of adapted bikes. “Michael has been visiting Edinburgh ABC since early October 2016 and is already hooked on cycling. His mum told us he had to give up cycling for a long time as he had outgrown his three-wheeler bike and couldn’t ride on the roads. 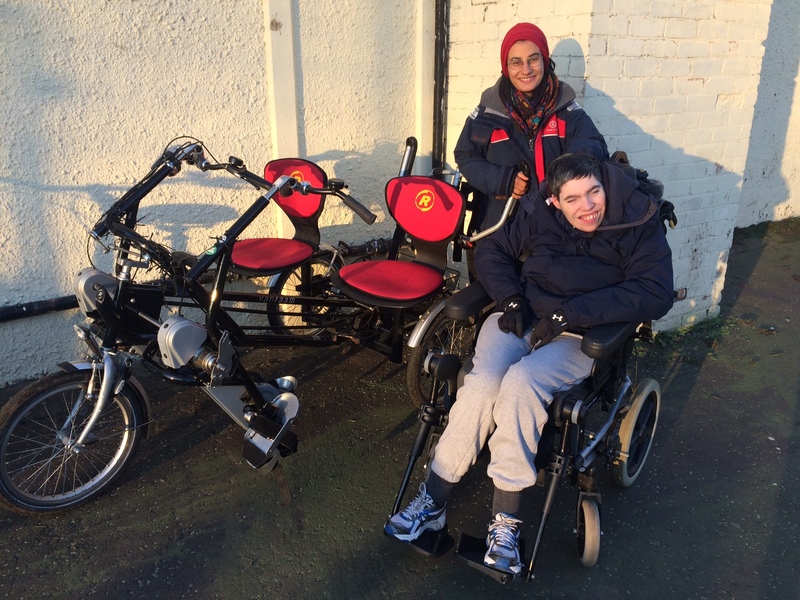 The side-by-side bike suits Michael and Silvia perfectly, as Michael can pedal along while Silvia steers and brakes, and they can talk to each other while they ride, it’s given him freedom and mobility that he’s not experienced for a long time”.